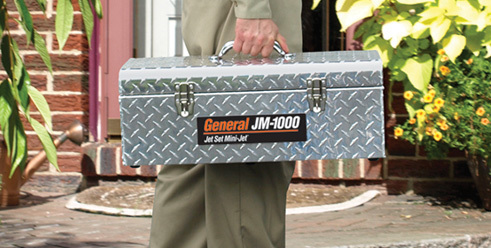 The lightweight, compact JM-1000 Mini-Jet gives you 1500 psi of cleaning power, yet weighs just 23 lbs. Clear grease, sand, and ice from 1-1/2″ to 3″ lines. The pump and motor assembly are safely contained in a rugged metal diamond plate case that can handle abuse in the field. The portable package takes little space in your truck – It’s only 24″ x 10-1/2″ x 11″. Water jets use a stream of high pressure water that hits the stoppage and flushes it away. 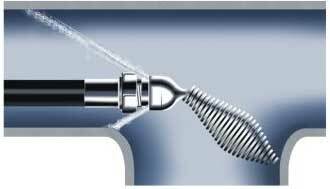 The thrust of the nozzle drives the hose down the line and gives you wall to wall cleaning action. Pulse helps the hose slide around tight bends and farther down the line. This is what separates General’s Jet-Set from ordinary pressure washers. It breaks the initial tension between the surface of the hose and the walls of the pipe, increasing cleaning power. A Water Sensor “senses” the moving water and automatically shuts off the motor if water isn’t flowing through the pump to protect the unit from damage. Pound for pound and dollar for dollar, the Mini-Jet is a great (and small) investment. Compact, lightweight unit weighs just 23 lbs. 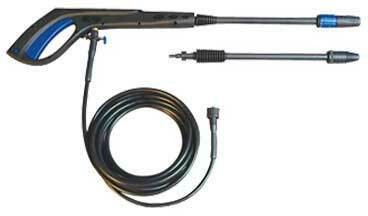 Clear grease, sand and ice from 1-1/2″ – 3″ lines. Generates 1500 psi at 1.4 gpm, pulls only 13 amps. Water Sensor “senses” moving water and automatically shuts off motor if water isn’t flowing. Rugged metal diamond plate case handles abuse in the field. 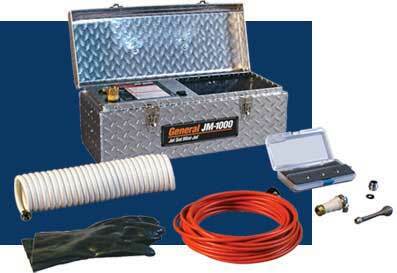 Mini-Jet includes Super-Flex™ high pressure jet hose, 4 pc. nozzle set, water supply hose, shut-off valve, universal faucet adapter and threaded faucet adapter. The lightweight, compact JM-1000 Mini-Jet weighs just 23 lbs. so it’s small enough to store conveniently in your truck. Clear grease, sand, and ice from 1-1/2″ to 3″ lines. JM-1000 Mini-Jet, plus 30JH00 (30′ x 1/8″) Hose, JN-0 Nozzle Set, Water Supply Hose, Shut-Off Valve, Universal Faucet Adapter, Threaded Faucet Adapter. JM-1000 Mini-Jet, plus 50JH00 (50′ x 1/8″) Hose, JN-0 Nozzle Set, Water Supply Hose, Shut-Off Valve, Universal Faucet Adapter, Threaded Faucet Adapter.